One of the larger holiday resorts, Marmaris is probably the most European of the Turkish resort towns on the Mediterranean coast, and a bustling cosmopolitan tourist centre in the summer months. 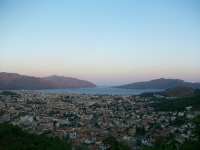 Marmaris also marks the start of the Turquoise Coast along the Mediterranean Sea. Built around an extensive natural bay at the foot of forested mountain slopes, the town is the best base for some of the finest sailing on the Mediterranean, with a modern marina catering for private yachts and the Blue Voyage holiday cruise business. According to legend the town got its name when, not finding the castle he had commissioned on the hill to his liking, Süleyman the Magnificent muttered 'Mimari as' ('Hang the architect!'). To enjoy shopping in Marmaris, holiday visitors need to be clued up and prepared. Vendors, particularly in the bazaars, can be annoying with their touting (although this is illegal), and there are a large number of fake designer goods on sale. If you fancy a bargain-priced Rolex watch, be prepared for it to be fake, although this does not mean it is not worth buying because in Turkey counterfeit products are often good quality! Prices are low, and everywhere, except in the larger stores, haggling is expected and it is possible to knock about 30 percent off the asking price. Bearing all this in mind Marmaris can be a shopper's delight, particularly for items like leather, ceramics, jewellery, and carpets. Best value goods are to be found in the Carsi Market in the Ottoman Castle, where 200-odd shops and a flea market are open seven days a week. The Thursday market is a colourful experience where locals sell fruit, vegetables, fabric, and clothing. Netsel Marina is a good place to find original designer clothing. 'Caam Ball', a locally-produced pine-scented honey, is a popular souvenir. Duty free goods are also on offer. Whether you want to go international, or try local fare at a lokanta (Turkish restaurant), Marmaris' hundreds of dining establishments will have something to suit any holidaymakers' appetite and any pocket. You'll find fish 'n chips, good Chinese, satisfying German, or the ubiquitous Italian. Visitors should not balk at sampling Turkish cuisine, particularly, popular doner kebabs and seafood meze platters. Marmaris' wild nights are centred on Bar Street around the waterfront, packed with nearly one hundred nightclubs and bars that rock until about 4am, attracting hundreds of holidaymakers. Although the atmosphere is fun, be aware that the price of drinks in Bar Street is significantly higher than other parts of town. Many restaurants stay open all night to cater for early morning revellers. Holidaymakers who prefer to spend their beach time being active will be spoilt for choice at Marmaris where dozens of watersports operators service the sea front, offering everything from banana boat rides and paragliding, to jet-skiing and scuba diving, all at very reasonable prices (which can usually be bargained down even more). The local Atlantis waterpark is a must for families. Those who want to sightsee or explore can choose from a variety of excursions, including guided horse safaris through the countryside or jeep safaris to visit nearby country villages, with visits to verdant untouched forests where crystal waterfalls beckon one to have a dip. The ancient site of Ephesus and the spring waters of Pamukkale are also popular outings, as are a variety of boat trips, including the nearby Greek island of Rhodes. Touts for everything from restaurants to excursions and souvenir stalls can be annoying in Marmaris. Many have also reported on various tourist rip-offs, and visitors should be alert. The summer months can be incredibly crowded, swelling the town population from around 28,000 to nearly 250,000.